take these chances: truth in disguise: my president is black. This is the image of a t-shirt that was crafted after a song written by "Young Jeezy." President Obama came to visit Texas A&M, and was welcomed by former President George Bush Sr. to hold a lecture on service. Honestly, I think there is no better place President Obama could have come to talk about this, considering A&M is one of the biggest proponents of community service and opportunities for volunteerism. I was disappointed, however, when I saw people wearing these shirts. God has ordained President Obama to be the leader of our country. I respect and fear God, so I will respect President Obama as my leader as long as he has authority over this country. I have no problems with his race, and would never consider that a setback or advantage to his position. He is a person leading our country. I do have a problem being associated with "racist conservatives" who don't appreciate or applaud his race. I am not racist, nor do I believe that conservatism on a whole promotes racism. 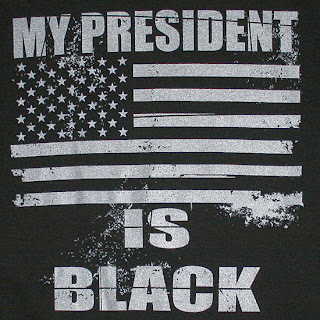 After all, for the past 200 years, we have not been wearing t-shirts that say "My President is White." If you don't want President Obama's race to be a factor, don't make it one. I'm not.